After checking the dots out, the scientists suspect they're click beetle larvae. 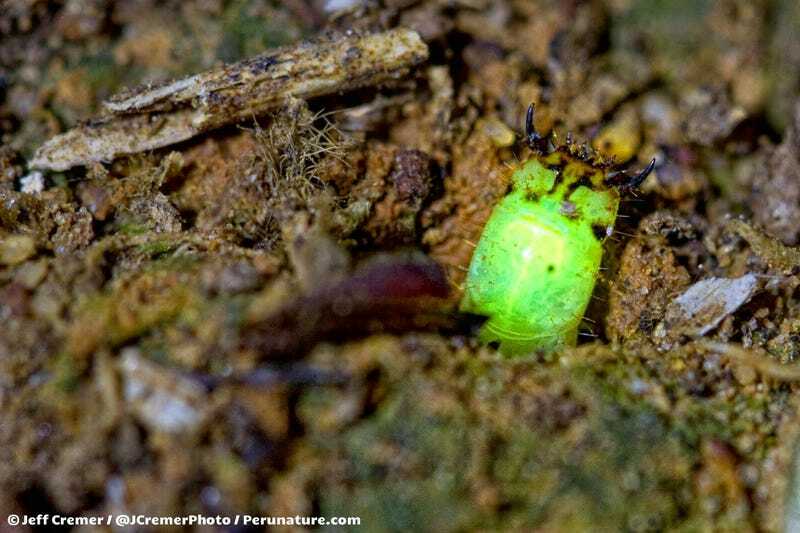 Cremer returned to Refugio Amazonas in the Tambopata rainforest earlier this year with entomologist Aaron Pomerantz and University of Florida graduate students Mike Bentley and Geoff Gallice to see what they could uncover about this mysterious green glower. Bioluminescence can evolve for any number of reasons, but the orientation of these small critters - their mandibles sticking straight up out of the dirt - suggested that they might use their light to lure in prey. Like moths to a flame or to your porch light, the idea is that their prey might be attracted to the glowing green dots. Then when an insect comes close enough...CHOMP! To verify their predatory nature, the entomologists did a fairly obvious test: they put an ant on the end of a stick, and then presented it to the larvae. "Sure enough they were voracious, clamping their mandibles shut and dragging their prey into the tunnels...never to be seen again," explains Pomerantz on the Rainforest Expeditions blog. But what are they, exactly? It's still an open question. We believe these belong to a family of beetles called Elateridae, which are commonly known as click beetles. But beyond that, we are not entirely sure what species this is or if it has been described yet (perhaps through the power of the internet we can get an answer). Elateridae is a very large family with around 10,000 described species in the world and only about 200 species have been documented to display bioluminescence. Some species of glowing beetle larvae in Brazil can be found in old termite nests where they attract and catch prey like ants and termites. The behavior that we observed where the larvae had utilized a dirt wall, as opposed to a termite mound, for their home and hunting ground could be a different niche not yet documented for this enigmatic group of glow worms. It's amazing that you can find critters unknown to science simply by keeping your eyes open on an evening walk through the rainforest. All photos copyright Jeff Cremer, used with permission.